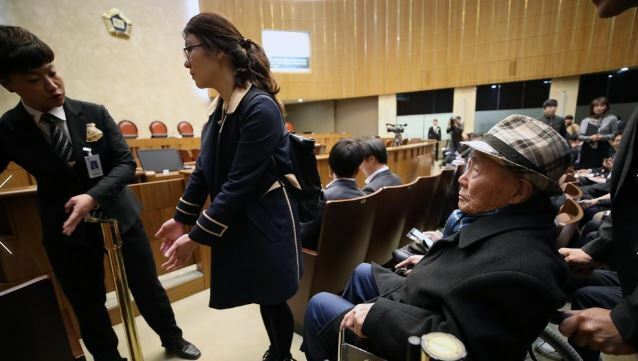 South Korea's Supreme Court was set to rule Thursday on damages claims filed by Koreans against a Japanese firm over wartime forced labor and unpaid work. The four-judge bench will deliver its ruling at 10:00 a.m., regarding two separate cases involving 11 elderly Koreans and a victim's family who seek compensation from Mitsubishi Heavy Industries. The rulings come about a month after the top court upheld a 2013 appellate ruling that ordered Nippon Steel & Sumitomo Metal Corp. to pay each Korean plaintiff 100 million won (US$88,000) in compensation. The Oct. 30 ruling further soured the frayed ties between Seoul and Tokyo. Four female victims, including an 87-year-old surnamed Yang, filed the damages suit in 2012 for working without pay at a Mitsubishi aircraft plant in Nagoya in 1944. They claim they were tricked by their school headmaster into believing that they would earn lots of money if they enlist in the Korean Women's Volunteer Labor Corps. Six other victims, including a 72-year-old surnamed Park, filed for damages against Mitsubishi for toiling without pay at Mitsubishi's Hiroshima munitions and shipbuilding plant in 1944.